The latest state to publish insurance rates under Obamacare is Maryland. The results seem consistent with the pattern we’ve seen so far. When state officials want the law to work, it works pretty well. And Maryland officials want the law to work. The governor is a prominent Democrat and among Obamacare’s most vocal boosters. The state political establishment supports him. The officials in agencies working on Obamacare—the state Department of Health, the Insurance Administration, and the newly created Health Benefits Exchange—feel the same way. None of this is surprising: Maryland is a strongly blue state. Obama is popular there and, one imagines, so is his health plan. The state also has a long, relatively successful history of regluating its health care system. It is, for example, the only state that sets prices for hospital services. Whether or not the system is as good as its promoters say, it means the state has an ample supply of officials who understand health care—and have a good working relationship with their private sector counterparts. Even so, Obamacare presented Maryland officials with new challenges. In April, CareFirst, the state’s largest insurer, announced that it was seeking a 25 percent rate increase. It was the first such announcement and the first concrete sign that the offiicial, pre-subsidy insurance premiums under the Affordable Care Act would rise in most states, because of new regulations that guarantee decent benefits and prohibit insurers from discriminating against the sick. But officials pointed out that CareFirst’s bid was just that: A bid. Rates were not final until the state’s insurance commissioner reviewed and approved them. Once that "rate review" process was done, officials said, the rates might come down. 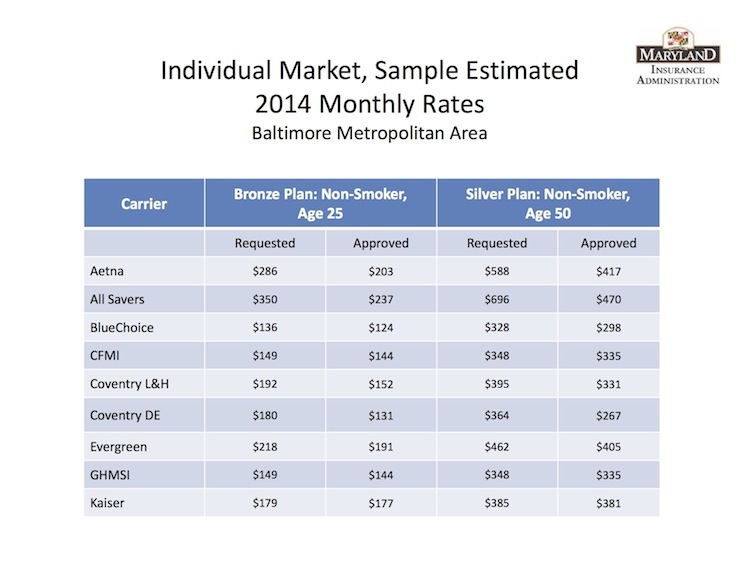 ...the lowest price for a Bronze plan for a 25-year-old in Maryland was $114, compared to $134 in Virginia, $146 in Colorado, $163 in Ohio, $167 in Washington State, and $174 in California. Among Silver plans for middle-aged adults, Maryland rates were lower than those proposed or approved in all other states except New Mexico. For example, the lowest price for a Silver plan for a 50-year-old in Maryland is $260, compared to $319 in New York, $329 in Virginia, $343 in Colorado, $374 in Ohio, $376 in California, $392 in Washington State, and $400 in Rhode Island. I would say that looks like the state was successful in reducing the requested rates and getting a better deal for consumers. Active rate review can bring discipline to the process and provide some comfort to the consumers that the rates they pay are reasonable. The ACA has a big role or states if they choose to play it, and we may be starting to see some differences between states that are more active and states that are not. A caveat: You'll notice that Claxton used the phrase "looks like" and I used the word “appears.” Virtually every Obamacare announcement this year has included some spin, whether i'ts from the law's supporters or its critics. Because this comes from officials who support Obamacare, it’s possible the numbers won’t look quite as good after further scrutiny. Still, even the people paying more will be paying rates that compare favorably with insurance premiums at large employers. And many other people will be paying less than they pay for insurance today—either because they are the older, sicker people who end up paying much higher premiums now or because they will qualify for the tax credits that Obamacare makes available to people making less than four times the poverty line. That’s about $45,000 for an individual or $94,000 for a family of four. It’s impossible to say definitively how many people will end up paying more and how many people will end up paying less, at least relative to what they shell out today. It’s not necessarily the most useful comparison, either, since people will generally be getting much better insurance. But Maryland officials say that three-fourths of the people buying on the exchange will receive at least some assistance from the subsidies. And for those with lower incomes, the resulting discounts will be worth thousands of dollars a year. So that gives you at least some sense of how many people are benefitting from the law. What this means for other states, of course, is another matter entirely. Plenty of state legislatures haven’t given officials the same authority to review insurance rates, and plenty of officials with that authority are disinclined to use it aggressively. On the other hand, the federal government is running many of these states’ exchanges directly. Even in the states without aggressive implementation, so far the announcements of rates have suggested their premiums will be at least in the same ballpark—higher than we’re seeing in Maryland, perhaps, but not much higher. Keep in mind that, ultimately, the premium rates matter mostly for what they say about the system’s long-term viability, since those subsidies effectively set standard nationwide prices for the cheapest silver plans in every region. Whatever happens elsewhere, a clear pattern is emerging. Obamacare is not shaping up as the train wreck its critics predicted. And in those states where officials are most committed to its success, it’s not even close. Postscript: Connecticut just published its rates too. More on that next week.